I just got back from the South by Southwest music festival in Austin. People are correct when they say that the festival has grown way too big, the traffic is impossible, and the parking is even worse. But despite all this, I managed to see a lot of good music. * The Ghost Wolves at the 720 Club: Barely a year ago, I’d never heard of this Austin-based band. But after seeing them tear up this Red River Street dive with their unique brand of punk/blues/garage sounds, I feel like an overzealous cult member bent on spreading the word. Singer-guitarist Carley Wolf and her husband, drummer Jonathan Wolf, rock wild. Their lyrics and song titles seem to seethe with anger. And yet, somehow, listening to them only makes me grin. Indeed, I was grinning like a fool at the 720. But the cool thing was that Carley was grinning even more. The lady has an infectious smile that serves to fortify her monster guitar playing. And she doesn’t even need all six strings to make her magic. On the last several songs, Carley played an electric guitar with only one string — the low E string, I think. Pure primitive power. * Nobunny at Hotel Vegas. I saw Wolves and I saw bunnies. If he were more famous, singer-guitarist Justin Champlin would do for shopping mall Easter bunnies what John Wayne Gacy did for clowns. And he should be more famous. Behind that ratty rabbit mask is a master of irresistible, hooky pop-punk songs. * Shinyribs at The Dogwood. I was a huge fan of The Gourds, perhaps the greatest group to come out of Austin during the great alt-country scare of the late ’90s. I’m not sure what happened to them, but singer Kevin Russell has carried on with a new band, Shinyribs, and done quite well. In 2016, they released a fine New Orleans-flavored album called I Got Your Medicine (the band's fourth since 2010). Just recently, Shinyribs was named Best Austin Band by The Austin Chronicle. *Count Vaseline at Hotel Vegas. Born Stefan Murphy, Vaseline is an Irish guy with a Beatle Bob hairdo who adopts the onstage persona of a deranged man standing on a soapbox and demanding that his crackpot warnings be heard. He started off slow. A growling guitar and ominous drums created the atmosphere as the Count went into a Jim Morrison-style vamp like some beatnik shaman. There is more than a little Mark E. Smith, the late frontman of The Fall, in Vaseline’s heady stew. He sounded like he was trying to stave off doomsday by prodding the audience to dance. Count Vaseline’s SXSW performance was much different than his recent release, Tales From the Megaplex, which is far poppier. I like that record, especially his Velvet-esque song called “Hail, Hail, John Cale” (“Lou Reed died wishing he could be John Cale ...”). But I like the weird live version of the Count even more. * Yamantaka // Sonic Titan at Hotel Vegas. This was my major music discovery at SXSW 2018. It’s an avant-garde experimental noise group from Canada that calls its style “Noh-Wave” — a sly reference to Noh theater, a Japanese musical theater that’s been around since the 14th century. The band has two female singers, one of whom plays guitar, the other playing percussion instruments, including a large round drum and cymbals. Yamantaka did one number with serious Native American overtones. My first thought was that it sounded like Yoko Ono had produced a powwow record. * The Waco Brothers at the Yard Dog Gallery. 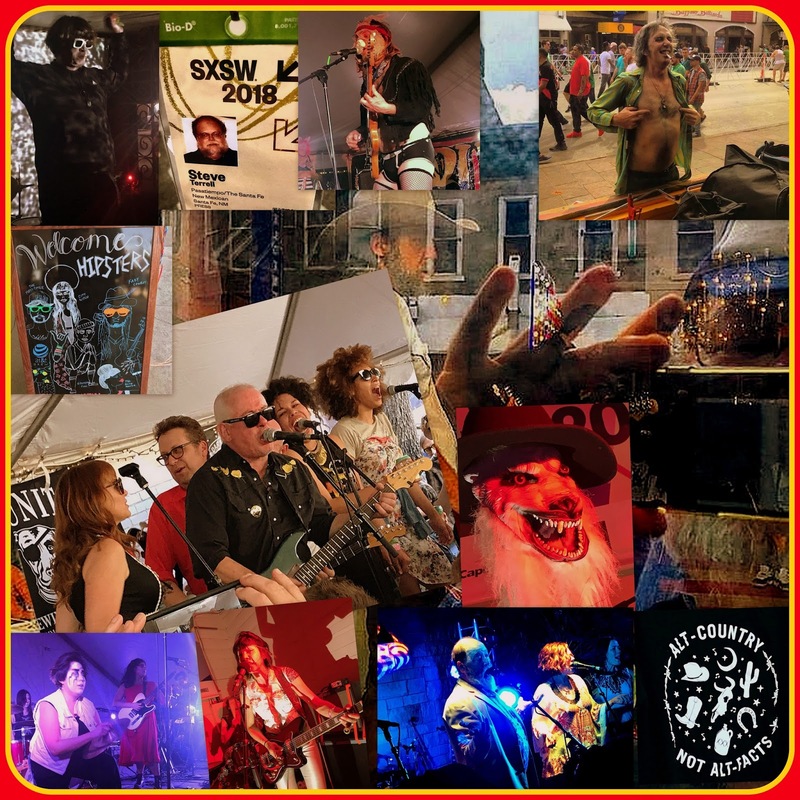 I’ve been going to see this band, led by Jon Langford of The Mekons, play the annual Bloodshot Records party during SXSW for more than 20 years now. I guess you could call it a ritual — a Dionysian ritual, where the frenzy becomes enlightenment — or something like that. The shows have all been high-energy, irreverent, frequently chaotic, and almost always inspiring. This year, they played their classic songs — “See Willy Fly By,” “Red Brick Wall,” and “Plenty Tough, Union Made,” including some of their most inspired covers like George Jones’ “White Lightnin’,” Johnny Cash’s “Big River,” and Neil Young’s “Revolution Blues.” My favorite moment came after their performance of “Walking on Hell’s Roof.” In the middle of the song, Langford announced a fiddle solo from Jean Cook. However, her microphone wasn’t working, so the solo went unheard. You could tell this irked Langford. So, after the song was done and the mike problem was solved, the band decided to play that part again so Cook could have her solo heard. It was short but amazing. * The Hickoids at Voodoo Doughnuts. This cowpunk/scuzz-country outfit is another band I make a point of seeing every time I go to SXSW. I’m pretty sure this set is the first time I’ve ever seen them during daylight hours — so now I can attest that it’s not the dark of night that makes The Hickoids maniacal. Singer Jeff Smith had an extra-long microphone cable and he used that to go out into the audience and harass — in the nicest possible way — law-abiding doughnut customers, getting in their faces, singing directly to individuals, and even going out onto Sixth Street and menacing passersby. He dragged at least one stranger into the shop, and he even sat on my lap for a few seconds. Showbiz is a wonderful thing.